Students at St. Margaret’s helped bring Graceanne D’Alberto and her service dog, Frankie, together. Graceanne D’Alberto met her best friend, Frankie, last spring. The two are constant companions, riding the bus together and sitting next to one another at church. They are affectionate with and protective of one another, and they seem to understand each other without speaking a word. They might be a pair of girlfriends but for one thing: Frankie is a service dog. For years, doctors have struggled to put a name to 8-year-old Gracie’s array of developmental disabilities, but she remains undiagnosed. Unable to walk, talk or effectively regulate her moods, she is a student in a special needs classroom at Roxboro Road Elementary School in Mattydale, NY. After Gracie had an incredibly positive inter­action with a service dog at school, the D’Albertos decided their daughter needed a dog of her own. They connected with 4 Paws for Ability, an organization in Ohio that trains dogs for people with disabilities. Each applicant is asked to become a volunteer fundraiser for 4 Paws, and the D’Albertos needed to raise $13,000 for a dog for Gracie. They reached out to friends, neighbors and their faith community at St. Margaret’s Parish for help. Lisa Perla, a first grade teacher at St. Margaret’s School, saw Bethany D’Alberto’s call for support for her daughter’s cause in the church bulletin. Each year, the school selects an animal-related organization to support in honor of the Feast of St. Francis, so Perla knew the project would be perfect. The whole school quickly got on board. “Our principal, Sue Donze, stressed to us and we relayed to the children that the essence of the Gospel is Jesus dying and giving himself completely. Jesus told us that it is more blessed to give than to receive…and we wanted to provide the children with something very specific, so they could see the fruits of their generosity,” Perla said. The school was indeed generous, presenting the family with about $3,000 raised through dress-down days and direct donations from families and teachers. Combined with the proceeds from other fundraising efforts, it was enough to put the D’Albertos over their goal. 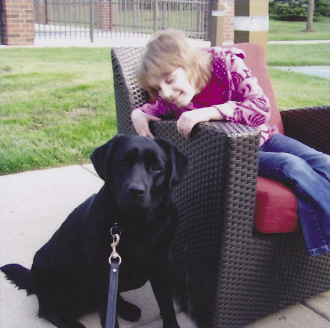 Soon after, 4 Paws accepted Gracie’s application and began training the miniature black lab that in 2011 would become Gracie’s faithful companion. Frankie, named in honor of St. Francis, completed 500 hours of training during which she learned to open doors, press buttons, alert Gracie’s parents to problems and soothe the young girl when she can’t calm herself. In a remarkable maneuver called an “over,” Frankie lays chest-to-chest with Gracie and forcibly slows her own heartbeat — which makes Gracie’s heart slow, too. Frankie came home in May 2011, and Gracie’s improvement has been dramatic. She has been able to eliminate one of her medications, and she’s having “the best school year ever,” according to her mom. Gracie kisses her dog constantly and shares with her — signs of affection the young girl had rarely displayed before. Frankie has accompanied Gracie to visit St. Margaret’s, where the dog is a huge hit with the students who helped bring her home. And in May 2012, Frankie will be by Gracie’s side when she makes her First Communion. “We are truly blessed,” said Bethany D’Alberto of the generosity of the community, including students at St. Margaret’s who helped bring a very special little girl and very special dog together.